We have been on the Carl Wendler Ranch for two months now. We are deep in the country. Just how deep? Deep enough so that at night, the only light in the sky is from the moon and starts. From the marker in the photo, we are about 1″ southwest in the small cluster of white buildings. The ranch covers 200 acres and includes 5 ponds, 2 deer feeding areas, 1 oil well and about 25 head of Black Angus cattle. There is a permanent caretaker, Morris, on the ranch who is originally from Michigan. He and his wife traveled to the ranch each winter for about 15 years. Then they decided to just stay on the ranch permanently. This works out well for owner, Carl, since he lives in Schulenberg, TX about 40 miles south of Ledbetter. Carl was born on this ranch over 80 years ago. He know the place and most of the folks in the area pretty well. While Carl may not be able to do as much as he once did, he certainly knows how to maintain his ranch and care for the cattle. He herds the cattle with a 4-wheeler. 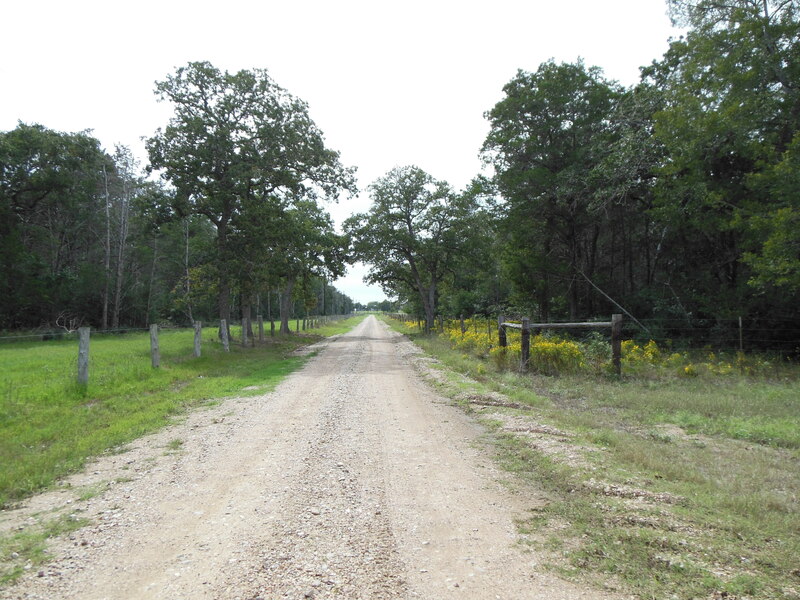 The ranch house and our parking space is just down this road – first cattle guard on the left. 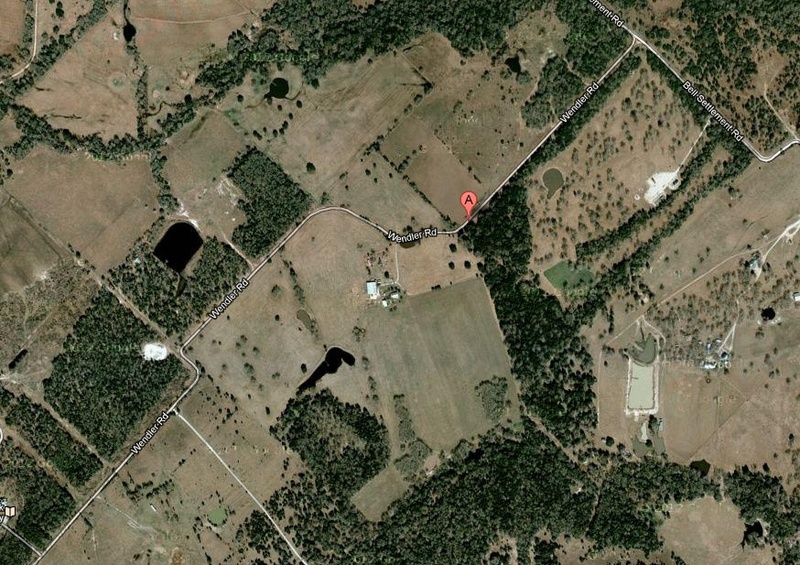 The ranch property is on the left side of the road. You can tell the difference between the Wendler ranch and his neighbor across the street on the right. Living in the country has advantages and disadvantages. For one, it is very quiet out here, especially at night. It is so quiet that you can hear a train horn from many miles away. It is also very dark at night. There is no glow from city lights out here. Dark is real dark. Also, there is no hustle-bustle out here. Things get done when things get done. There is an endless list of things that need to be done. Nothing is so important that it has to be done in a hurry. Working with cattle is much easier than working with llamas. Cattle do not need daily attention for feeding and care. They pretty much roam the pastures where they wish. Occasionally, the cattle need to be moved from one pasture to another. The trick there is to get one cow through the gate, the rest will follow. Pasture maintenance is pretty simple, no need to for picking up cow dung on a daily bases. Main disadvantage is nothing is close. The nearest grocery store and Walmart are 10 miles away. Both of these are small so their stock is limited. For a larger grocery store or Walmart, we travel to Brenham about 25 miles away. That is also true for a visit to Lowes or Home Depot. A trip to a dinner out will take a 30 minute drive or so. If we want to catch a new movie, we need to travel even further. Trash is handled differently in the country. There is no trash pick up on the ranch. Glass, steel cans, aluminum, plastic, paper and cardboard are collected for a trip to recycle center in LaGrange. Food scrap gets dumped in the pasture for the nocturnal critters. What ever is left is burned. So there it is. Life is good in the country. Thanks for stopping by – y’all come back now. Well, gee, you’re really in my old neighborhood, as Brenham is still what I consider my hometown in Texas. Used to live right on Main Street and owned two houses on the lot which was bordered by Main on one side and Alamo on the other. The purple house art gallery was right across the street from the Alamo house, which is where my Mom lived. I lived in the larger home on the Main side. Great cattle country around that area, as well a superb cycling, too! Geez, I’m getting “homesick” thinking about it! Ya’ll enjoy yourselves; sounds like an idyllic setup. Yep, even with the distance to Walmart and HEB!